Stuart Greenbaum writes about his impressive series of sonatas, at the same time revealing a lot of interesting detail about his work in general, from its inspirations down to his approach to style and structure. Greenbaum's next sonata premiere will take place on 14 November as part of ANAM's concert series at the South Melbourne Town Hall. As composers, we tend to exist in an unpredictable 'feast or famine' duality. Our careers may seem to develop over decades, but from month to month the phone can go quiet without warning. This has happened to me a number of times. It's unnerving; naturally you question yourself as an artist (as we should). What becomes obvious is that when you aren't in demand, you need self-driven projects. These can be a blessing in disguise. Two years later I wrote Sonata for alto saxophone and piano (2002) for Barry Cockcroft and Adam Pinto. I staged a concert of all my saxophone music and recorded and released a CD (Mercurial) featuring both sonatas. These were mostly self-funded activities with some goodwill on the part of the performers. It would be more than a decade before I revisited the sonata as a medium. In 2013, I was commissioned by Liam Viney and Anna Grinberg to write a work for piano 4 hands. We successfully applied to the Music Board of the Australia Council for the Arts for a 12-minute piece. But early in the composition process it became clear that it was going to be bigger, and Sonata for piano, 4-hands emerged as a 20-minute work (see video below). Later that same year, I wrote a Sonata for guitar for longtime friend Ken Murray. And, in 2015, I wrote Sonata for trombone and piano for American trombonist Don Immel, who had recently taken up the post as head of brass at the Melbourne Conservatorium of Music (where I work). And that was probably the tipping point. I had to consciously look at what I was doing and consider if this was becoming a 'thing'. So I took some time to look through composers who wrote sonatas. So, who does write sonatas? Hindemith, no doubt, takes the cake. He wrote one for every major orchestral instrument (he played most of them) and wrote a few more besides. 26 sonatas in all. To be honest, Hindemith is not that close to my own musical aesthetic. But I admire his intent to create such a large body of major recital works. I think it's a great idea. I aim to do the same. My list is a little different, but the Greenbaum Sonata Project owes something to the mountain that Hindemith climbed. Having consciously acknowledged what I was doing, the floodgates fairly opened. Since 2015, I have written seven more sonatas for lots of wonderful Australian musicians, including Paul Dean, Kevin Power, Joel Brennan, Konrad Olszewski, Emma Sholl, Celia Craig and David Barnard. Extract from Stuart Greenbaum's Sonata for oboe and piano. I'm not the only one - there are plenty of contemporary composers in Australia and around the world who are writing sonatas, and it's fair to ask why. It sounds somewhat old-fashioned. The term 'sonata' (in the literal meaning of a piece played) connects to an ongoing canon of large-scale instrumental recital works across three centuries. While the term perhaps does not adequately describe the sound or genre of my musical language, it describes (to potential performers and audiences alike) the size of the canvas: duo (sometimes solo) of around 20-25 minutes. Most are accompanied by piano, though some are unaccompanied. Across the wind, brass, percussion and string families, this will comprise around 20 works. The complete project will constitute a collected body of work of around seven hours of music. The project aims to create a substantial recital work for all major orchestral instruments, contributing new repertoire for professional and emerging artists. And these instruments need new, relevant repertoire written by people who live in the times and society that the performers of these instruments live in. But it's more than just that; I see it as an ideal forum for musical expression. A canvas that I have come to know intimately - a jump rope that I trust before hurling myself off the cliff. Do sonatas have to be in sonata form? Material recurs, certainly, but order, proportion, expansion and contraction don't bear much resemblance to classical sonata form. Some works are in three or four movements, but could be in a single extended movement or as many as ten movements. 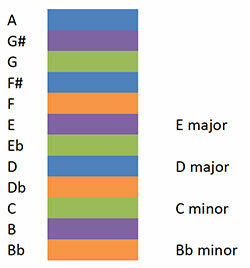 Every new sonata is intended to consolidate established techniques and language but also to develop new ideas. I've also written two works that are not called sonatas, but I'm wondering if they might be (at least by comparison with the ones I have written). Ice Man (1993) is a half-hour work for solo piano in three movements that further divide into nine sections. It was premiered by Glenn Riddle and most recently recorded and released in full by Amir Farid. Natural Satellite (2013) is a 22-minute guitar duo, written for the Grigoryan brothers, in five movements. Slava and Len premiered this at the Melbourne Planetarium during Scienceworks with DigitalSky programming by Dr Tanya Hill. Back in 1993, I wasn't thinking about sonatas at all. 20 years later I was on the cusp of thinking about sonatas a lot more. A guitar duo seemed slightly outside the model, but a sonata does not have to be limited to solo melody and accompaniment. I'm not drawn to technical virtuosity for a soloist (it's not what I seek); and I definitely don't need um-cha-cha, um-cha-cha accompaniment in my music. Those sonatas I have written for two instruments are inherently duos. So Natural Satellite (and Ice Man) might require a little re-labelling. A few of my sonatas are abstract but most are programmatically concerned with the planet Earth, our solar system and the universe. Taking scientific discovery as a starting point, the works imagine journeys in time and space. Voyages in relative isolation; strange, breathtaking destinations; the power of homecoming. These journeys are ultimately motivated by questions of identity: of who we are, where we came from, why we seek to explore the unfamiliar, and how we might consider our contemporary lives. As an example, Sonata for flute and piano (2015) is a contemplation of the projected discovery, in March 2015, of a huge underground ocean on Ganymede - Jupiter's largest moon. Supposing anyone actually made it to Ganymede alive, they would then be standing on an icy crust 150km thick. The 2nd movement ponders the seeming impenetrable scale of that. Extending the science fiction scenario a little further, even if we made it through the ice into the saltwater underground ocean, would we find life in the fluid darkness? It's an alluring idea - given scope in the 3rd movement - but a long way from home and probably deadly. 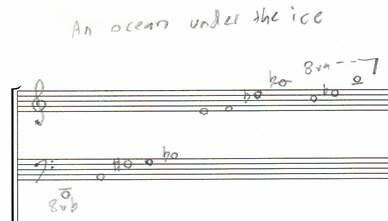 The final, brief 4th movement is a secular benediction for those in peril on the sea. How does that translate into music? The aim here was to capture something alluring, beautiful but probably deadly. It's grounded in D major but ultimately fully chromatic. Anyone who knows my music can hear that I am not a serial composer. Intuitively I write melodic, harmonic, rhythmically clear music. I seek beauty. But I also like intellectual challenges and anything to do with patterns, geometry and proportion. It's the friction of these elements that help me to find a way inside the music that is fresh and engaging - at least for me personally. Similar themes underline the current sonatas being written. I engaged with the Australian National Academy of Music to devise a set of low string sonatas (viola, cello, double bass). Given the Sonata for violin and piano was premiered at ANAM in 2000, it seemed appropriate to complete the full set of string sonatas where it all began. These three low sonatas take a radically different approach to structural design but programmatically form a sequence outlining the evolution of planet Earth, possible future abandonment of the planet and finally the search for a future planet capable of sustaining life in what is described as the 'Habitable Zone'. I do not choose to write about this theme because I think Earth is certainly doomed. I write about it because if we are to maintain its life-supporting qualities, we need to step back from assuming its certainty. I also see it as an antidote to the madness of our modern self-obsessed world. This is why I write about our home planet seen from a distance and our place in a larger universe. A cello sonata in a single half-hour movement will follow. After that, what remains? New sonatas for bassoon, horn, tuba, solo piano, percussion (solo or with piano), solo organ, solo harp, and electric guitar (with piano). And perhaps cor anglais too. How long will that take? If I haven't done that by the time I turn 60, please call me. Purchase the album Mercurial (Reed Music) via the AMC Shop, featuring Greenbaum's Sonatas for alto saxophone and piano, and violin and piano. Having studied composition with Broadstock and Conyngham at the University of Melbourne, Stuart Greenbaum now holds a position at the Melbourne Conservatorium of Music as Professor and Head of Composition. He is the author of over 200 works including 11 sonatas, 5 piano trios, 7 string quartets, 4 concertos, 3 symphonies and 2 operas.